Black handled rings indicate SuperCut scissors. Gold handles indicate that the scissors have Tungsten Carbide inserts. One gold handle and one black handle indicates that the scissors are SuperCut and have Tungsten Carbide inserts. Blue instruments are typically titanium. Looking for economical surgical scissors for your classroom or laboratory? Most of our economy line of surgical instruments are sold in packages of 12. These surgical instruments are perfect for students or for disposable use. NOTE: WPI surgical instruments are for laboratory research applications. They are not certified for use on humans. These surgical scissors are designed for left hand users. NOTE: WPI surgical instruments are for laboratory research applications. They are not certified for use on humans. 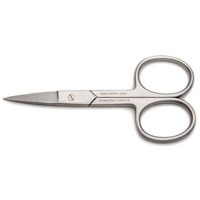 This product category includes bandage scissors, surgical wire cutting scissors, plastic handled scissors, ligature scissors, micro alligator scissors and left hand dissection scissors. NOTE: WPI surgical instruments are for laboratory research applications. They are not certified for use on humans. 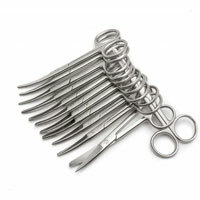 Our standard surgical scissors are the ring handled scissors. 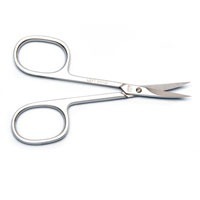 We offer a large variety of ring scissors for small animal surgeries and dissections. NOTE: WPI surgical instruments are for laboratory research applications. They are not certified for use on humans. 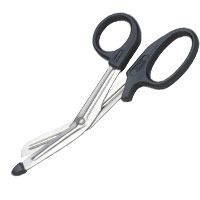 Our black handled surgical scissors designate our SuperCut scissors. These scissors have one on razor sharp blade and one micro-serrate blade. This construction offers a couple of advantages for surgeons. Sharp edge gives a clean cut with minimal tissue damage Serrated edge actually holds the tissue to prevent it from slipping while you are making an incision NOTE: WPI surgical instruments are for laboratory research applications. They are not certified for use on humans. 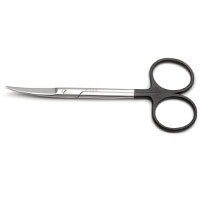 Our black handled surgical scissors designate our SuperCut scissors. These scissors have one on razor sharp blade and one micro-serrate blade. 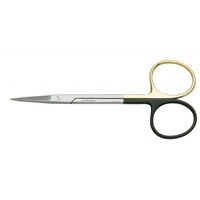 Surgical scissors with one black handle and one gold handle are SuperCut scissors with tungsten carbide inserts. Tungsten carbide is harder than steel, which means the instruments last longer. The SuperCut edges offer a couple of advantages for surgeons. Sharp edge gives a clean cut with minimal tissue damage Serrated edge actually holds the tissue to prevent it from slipping while you are making an incision NOTE: WPI surgical instruments are for laboratory research applications. They are not certified for use on humans. 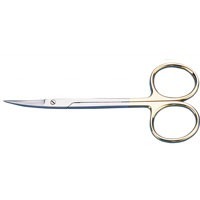 Our surgical scissors with gold handles have tungsten carbide inserts in the blades. Tungsten carbide instruments are more durable, hold an edge longer and last longer than stainless steel instrument. NOTE: WPI surgical instruments are for laboratory research applications. They are not certified for use on humans.